GLOBAL HOSPITALS GROUP - Conferred with Highly Prestigious Healthcare Award "India’s Most Admired Promising Hospital Chain 2012 Award" at 5th Annual Pharmaceutical Leadership & Business Leadership Awards 2012 Summit. Dr. K Ravindranath, Chairman & Managing Director, Global Hospitals Group received the Award from His Excellency Sri. Shankaranarayanan, Honorable Governor of Maharashtra on Friday, the 21st of September 2012 in Mumbai. 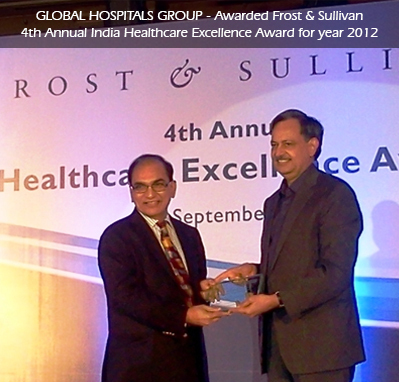 GLOBAL HOSPITALS GROUP - Conferred with Highly Prestigious Healthcare Award "Frost & Sullivan 4th Annual India Healthcare Excellence Award 2012" - Healthcare Service Provider Company in the up to Rs. 500 Cr category. Dr. K Ravindranath, Chairman & Managing Director, Global Hospitals Group received this Award on Friday, the 21st of September 2012 in Mumbai.